As of this weekend, I am a BIG fan of Farecast.com. I'll tell you right up front: my thumbs are reaching for the friendly skies. There are bunches of sites for booking flight reservations. Each airline has one, plus there are Travelocity, Expedia, HotWire, CheapTickets, PriceLine, and others. Sure, they all give you the best price at the moment you are searching. But Farecast gives something else in addition. Something that just saved my family $800 for some travel later this year. What is that something? 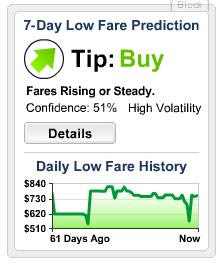 Farecast shows you not just a moment, but a trend for YOUR route when YOU are traveling. It made it really easy for me to be decisive about our purchase to visit the inlaws. This feature works best if you are planning a trip with months of advance notice. 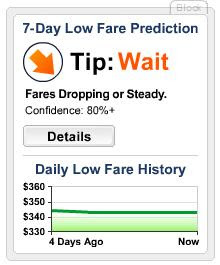 Simply enter your travel details (dates and number of people traveling), and it will show you available airlines and fares, along with this handy trend tool. I have been checking daily for our upcoming trip (another nice feature is that I didn't have to re-enter the flight information each time I checked). Fares were sky-high, much to my dismay. I was afraid we would not be able to afford to go. 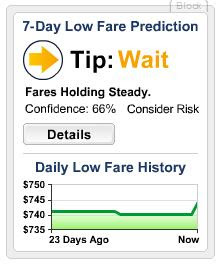 But when I checked again Saturday, Farecast told me to buy because fares had gone down by $200. WooHoo!! I found a schedule that worked for my family and booked right away. Fares actually went up DURING my transaction, but came back down as I kept trying. It was a very turbulent ride. Farecast does not currently offer the trend tool for all routes and all times. But it seems to be available on a healthy portion of them. It also offers a similar pricing tool for hotels. Farecast, which was acquired by Microsoft last spring, is now my one-stop shop for travel reservations. Check it out for your next trip.